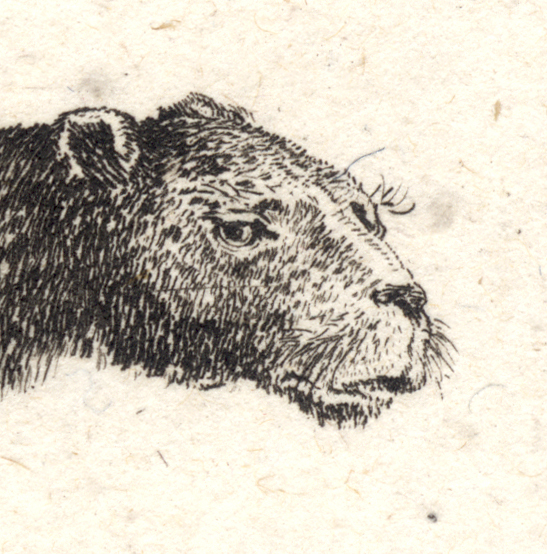 Etching on fine laid paper trimmed along the platemark. De Vesme/Massar 112.698.iii; Talbierska 54.9.iv (Alexandre de Vesme, Phyllis D. Massar 1971, “Stefano della Bella. Catalogue Raisonné”. New York); “Stefano della Bella: Etchings from the Collection of the Print Room of the Warsaw University Library”. Warsaw, 2001, cat. no. 54.9.iv. ; see also the description of this print at the Metropolitan Museum of Art (http://metmuseum.org/art/collection/search/377291) and at Harvard Museums (http://www.harvardartmuseums.org/art/244659). Condition: crisp and well-printed impression, trimmed along the platemark. 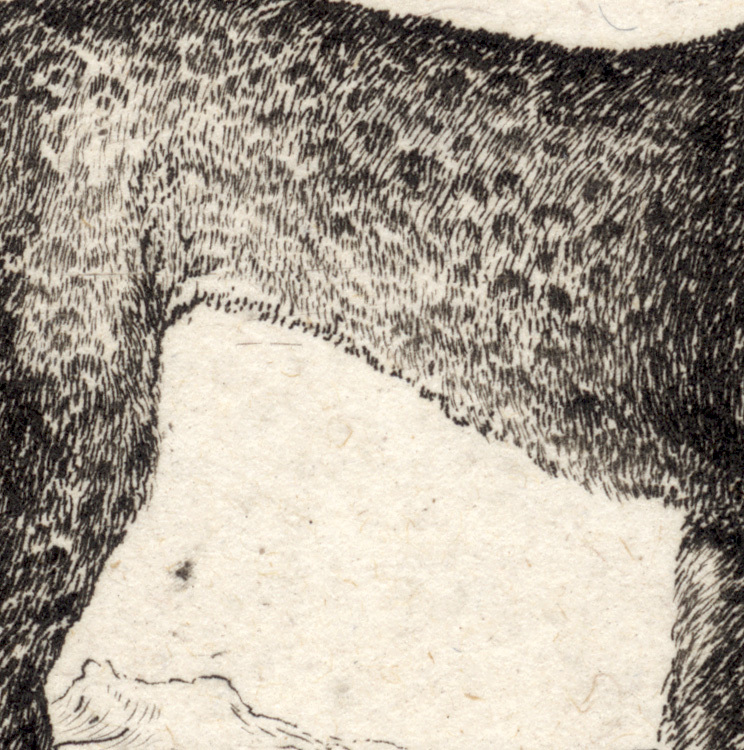 The sheet is in near pristine condition apart from a faint dot stain near the leopard’s front left foot. 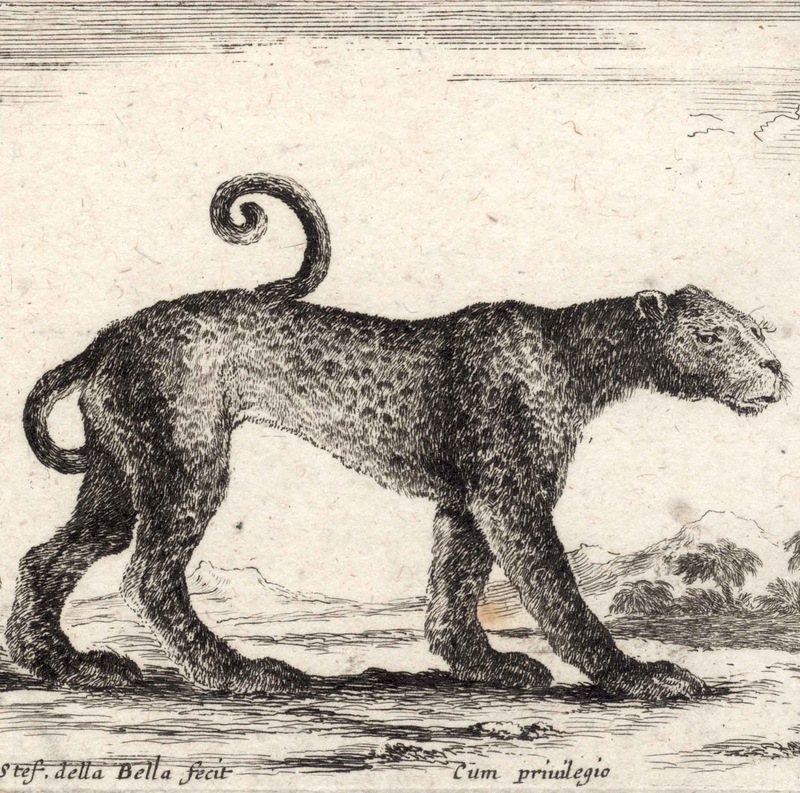 I am selling this etching by one of the famous old master printmakers of an exceptionally cute leopard with a tail that even a chimpanzee would be proud for AU$152 (currently US$114.80/EUR107.77/GBP91.17 at the time of posting this listing) including postage and handling to anywhere in the world. If you are interested in purchasing this highly sought after print, please contact me (oz_jim@printsandprinciples.com) and I will send you a PayPal invoice to make the payment easy. I wish that I knew a lot more about leopards so that I could speak with authority about this remarkably cute looking leopard, but, as I’m not, I will simply write down my thoughts as an internal discussion to myself and leave any inaccuracies for more learned folk to correct. Let me begin with this man-eater’s tail. Mindful that when Stefano della Bella executed this etching in the early 1600s, leopards were not lurking around every corner of Florence to be observed. 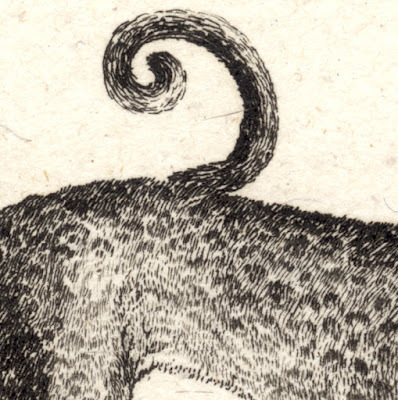 Consequently, the length of the tail and its spiralling curl may have been more fantasy than fact. 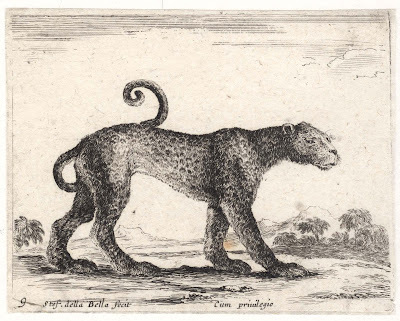 Based upon personal observations of leopards, a “real” leopard’s tail can only reach the beast’s front shoulder fully stretched whereas this leopard’s tail could tickle the man-eater’s chin. Regarding its curliness, I am not certain if leopard’s tails have the musculature to achieve the almost prehensile curl as depicted. Nevertheless, I imagine that the tail serves to balance the animal’s weight when it moves and helps in body-language communication with other leopards. With regard to body language, this curly tail certainly does “talk” about the spirit of inner alertness of this predator on the move. Beyond the lovely tail, I find my eye looking at the leopard’s face with its inscrutable Mona Lisa expression. To be honest, I’m not sure if della Bella planned for this chap to look forlorn, skittish or menacing. My reading of forlorn is driven by the cat’s downcast whiskers and the (arguably) downcast expression of its mouth. My reading of skittishness is all about this cat’s sideway glaze as it looks towards the viewer but moves in a different direction. Although I proposed that the animal may look menacing, I don’t really believe this. My memory of menacing animals is that they have their whiskers protruding out and their heads lowered and this cat isn’t exhibiting either of these signs. 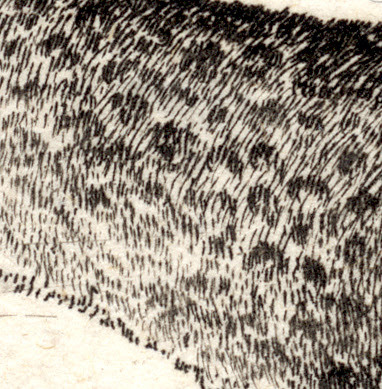 I would love to analyse the dot patterning that della Bella has employed to determine whether it is fact or fiction, but the details are too indistinct and so I will side-step this usually important issue in depicting leopards. There is another very important issue that I will end this discussion on and it concerns the placement of the leopard’s feet. Here, I believe della Bella has a problem. From my understanding of animal movement, if both feet on the right side of a leopard were to move forward—as shown here—and both feet on the left side move backwards the leopard would be unable to take another step. In short leopards don’t move in this fashion. Instead, the two feet diagonally opposed move forward while the other diagonally paired feet take the weight.